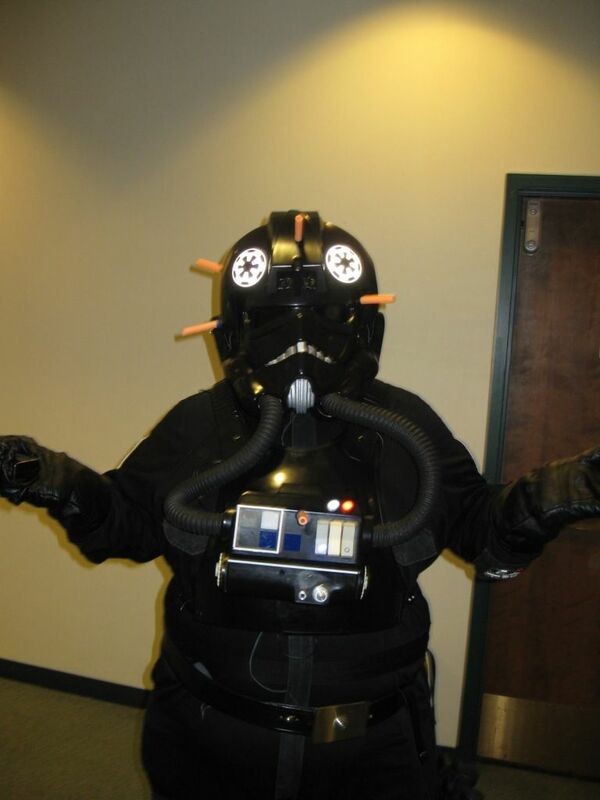 I kinda wanted to make sure you knew we are definitely out in costume and active. 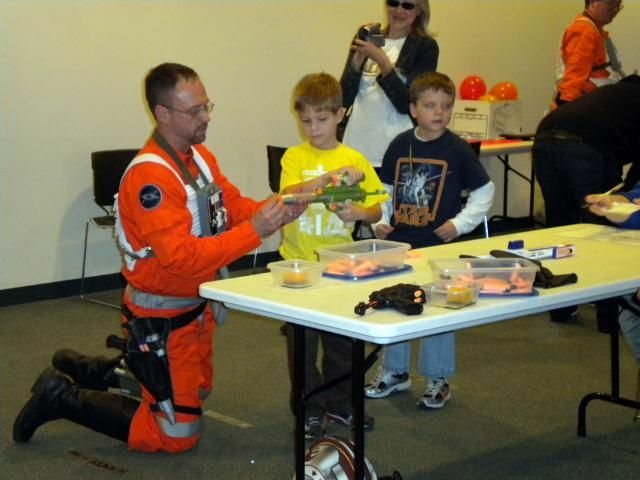 I will post some of the events that we have done since the official launch of our Base at the start of October. I hope that others follow suit and share their mission reports and photos with everyone.. I love to see the Rebels out there...well..Rebelling! 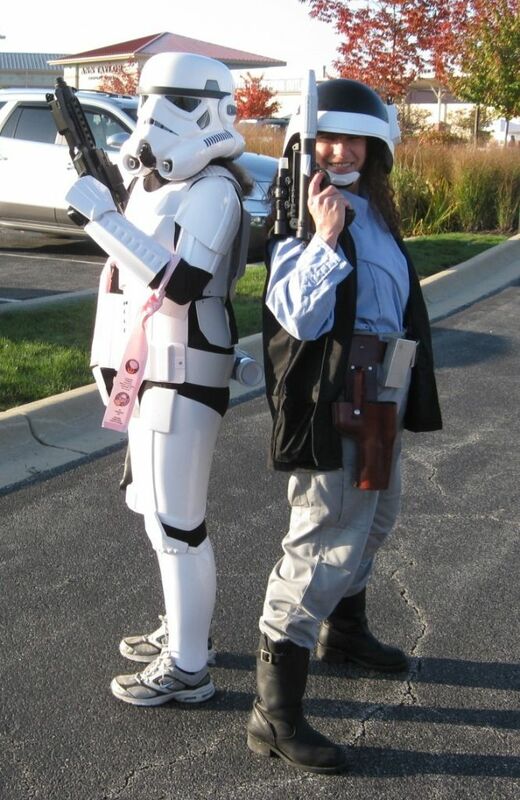 This request came through the Midwest Garrison for all costumes to come out and cheer on participants. 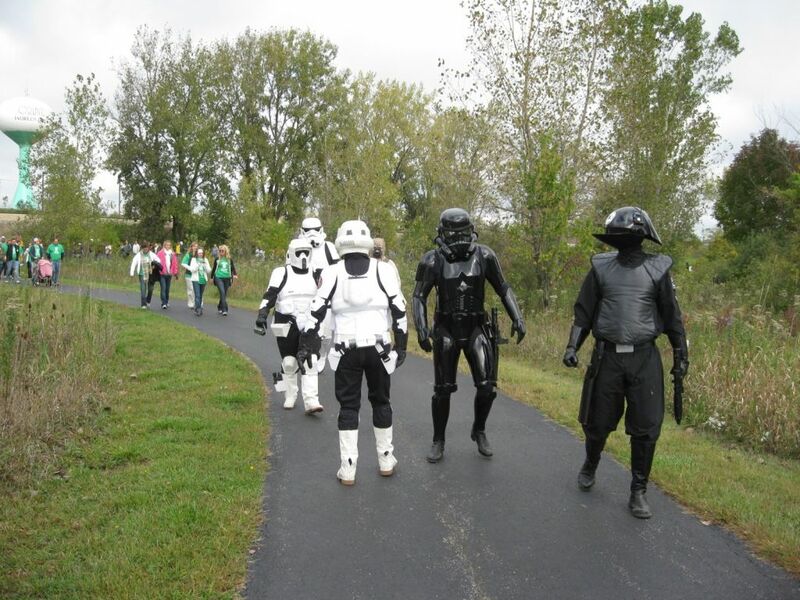 We were not there as fundraisers this time but only for "atmosphere" for the walkers. 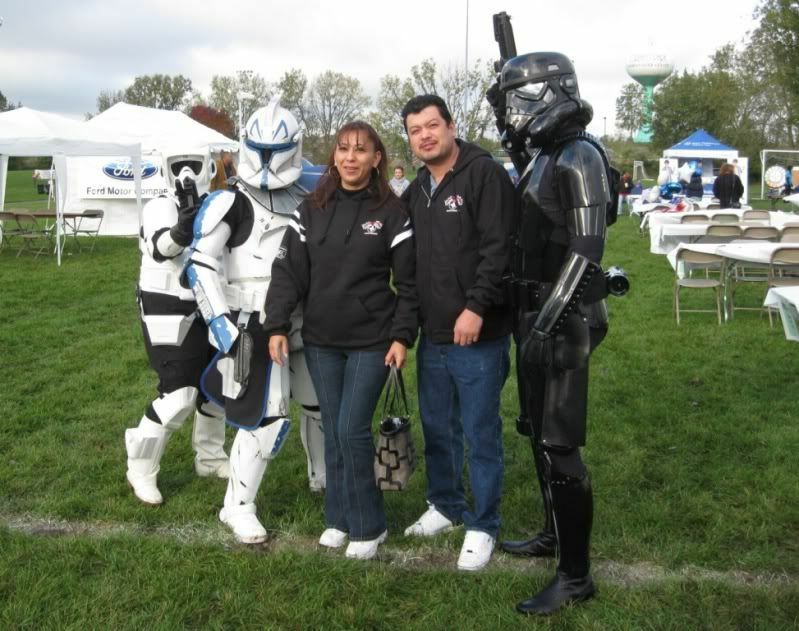 Crix and I put on our walking boots and joined members of the Midwest Garrison at the Ron Santo walk for the Juvenile Diabetes Research Foundation yesterday. It was a little brisk at the start, and there was a lot of mud around from recent rains...but that didn't dampen our spirits nor those of the participants. 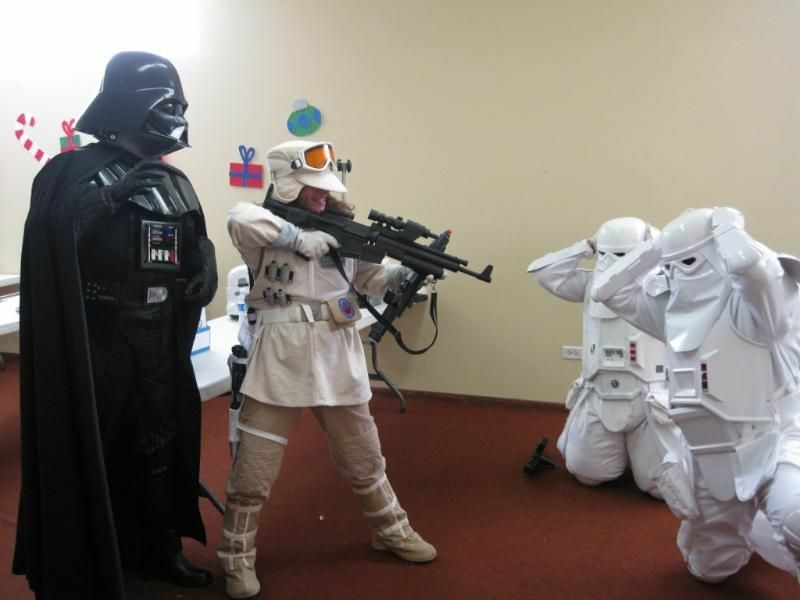 Interesting to note that one of our Stormtroopers carries an emercency supply of insulin on the belt of his costume as he suffers from diabetes himself. 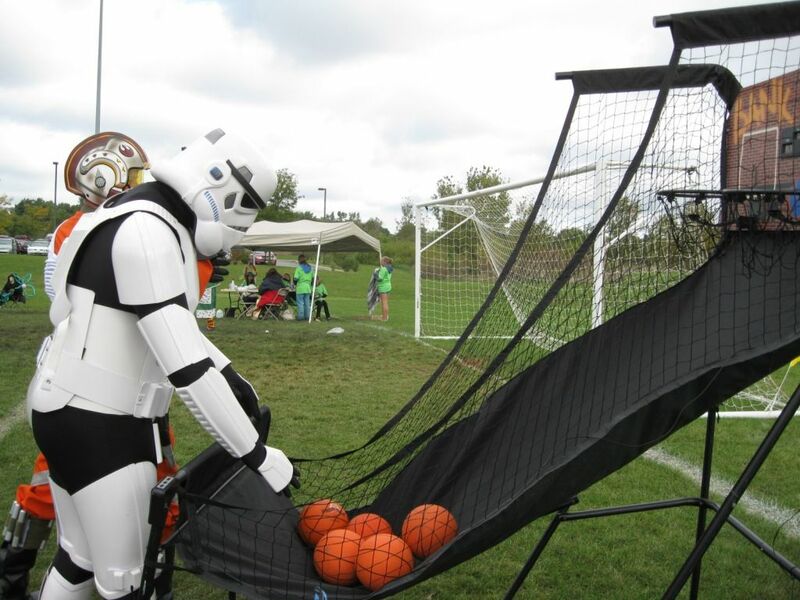 What do Stormtroopers do when things get dull on the old Death Star?? my Hat Trick for the weekend - 3 events in 2 days. I was not able to do the last outings for Pottery Barn, but this time I managed to sqeeze this one in before the DK event. I honestly was not prepared for the line of people waiting just to see us. The line started forming at 8:30 AM and the event did not start till 10:00 AM. As I always say- "it's Star Wars-a line is implied". When the door opened it was 2 hours of non-stop autographs and photos. I think my retinas are permanently damaged by camera flashes. The line just never seemed to go down as I could see it wind down the aisle and out the front door. I was afraid that we would not get to everyone before the noon deadliine. We all HAD to leave at noon as all 4 of us had DK events to do at other locations at 2:00 PM. We somehow managed to speed the line along for the last 45 minutes and got to see everyone in line. Just like McDonalds - over 2 million served...lol..
Everyone was (store employees included) were very welcoming and we had a great time. 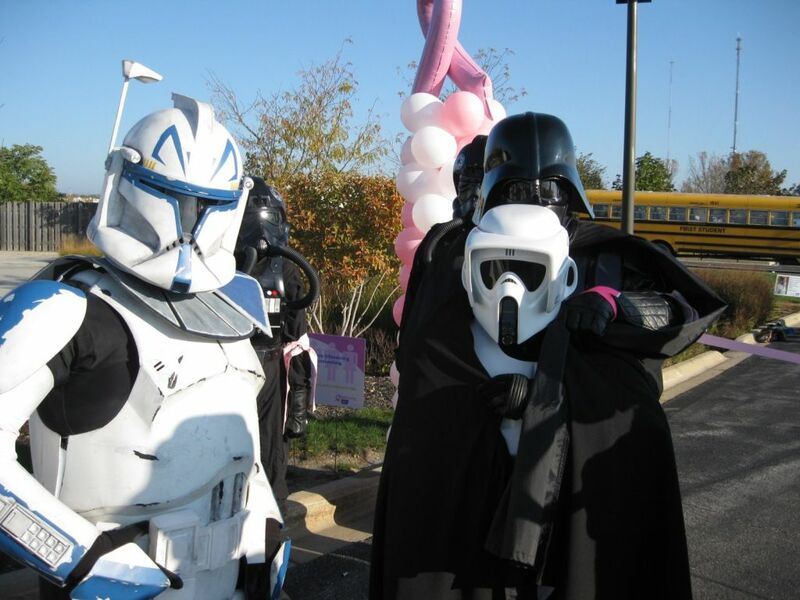 The best part is that for our efforts and the efforts of RL and 501st all over the country, a $10,000.00 donation has been made to St. Jude. 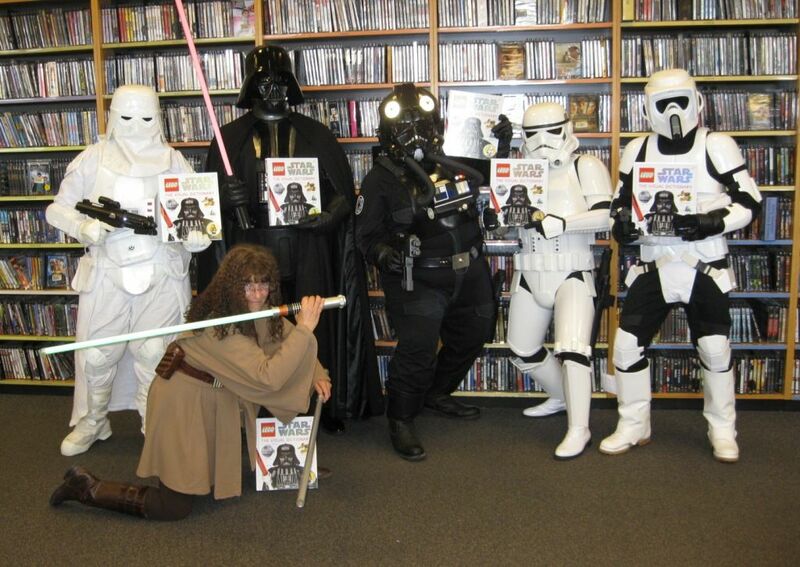 As with locations all over the country, the new DK Publication on "Star Wars" Legos arrived in LaGrange IL right on time. As zero hour approached all of the seats in the Special Events area were filled and the entire area behind and on all sides was filled to standing room only with some folks left to peering over the bookcases from the sidelines. 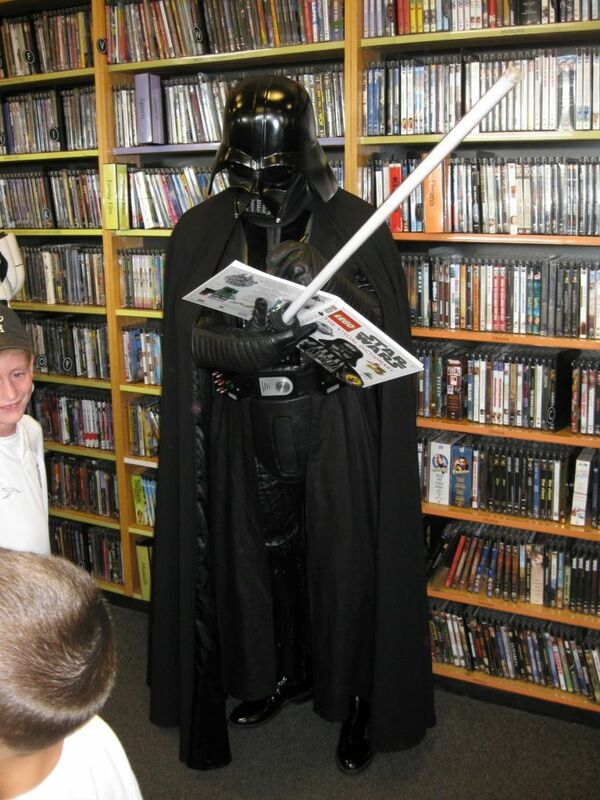 Before the event started I hung around the area awhile (I was still in my Jedi costume from the Pottery Barn event I had just come from) and found a young lady and her dad looking over the new book. Speaking to them I found out that this young lady (around 9 or 10 years old) and all of her friends were HUGE "Clone Wars" fans and gather each Friday night to watch the latest episode on Cartoon Network. They never miss an episode. We promptly made our entrance shortly after 2:00 PM and Kristin Sohacki of Borders led off the festivities with a costume contest for kids who might have brought their costumes along. Then one of the other Borders employees led a Trivia question challenge with prizes for the winners. 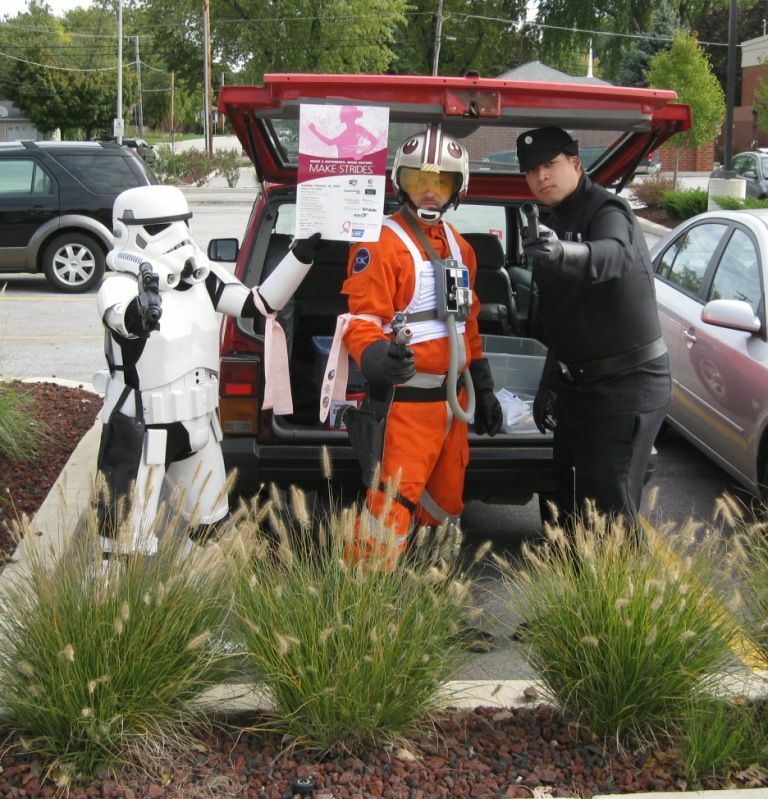 After that she had questions for us as members of the 501st. 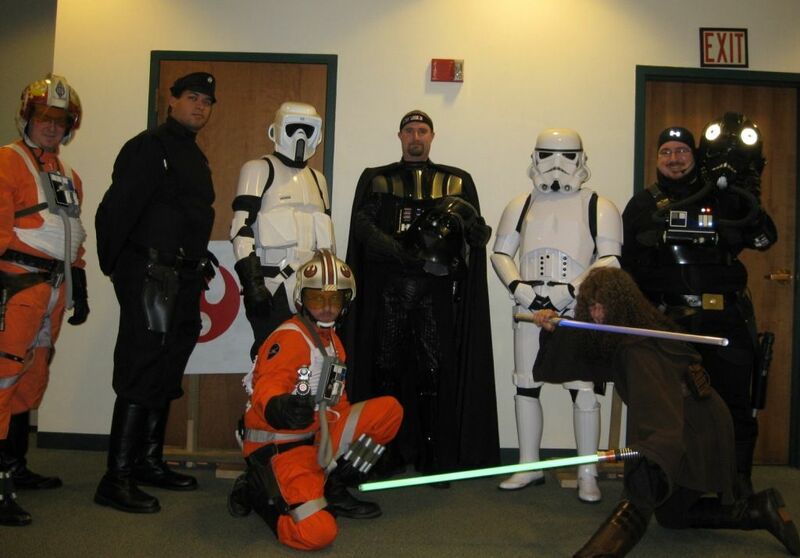 Thanks to Jessi Tampa for answering all of the questions regarding the 501st for our helmeted members. Then the floor was opened up for questions to Jessi. Lastly, everyone was invited for photos and autographs. Thanks to all of our troops that were able to come. 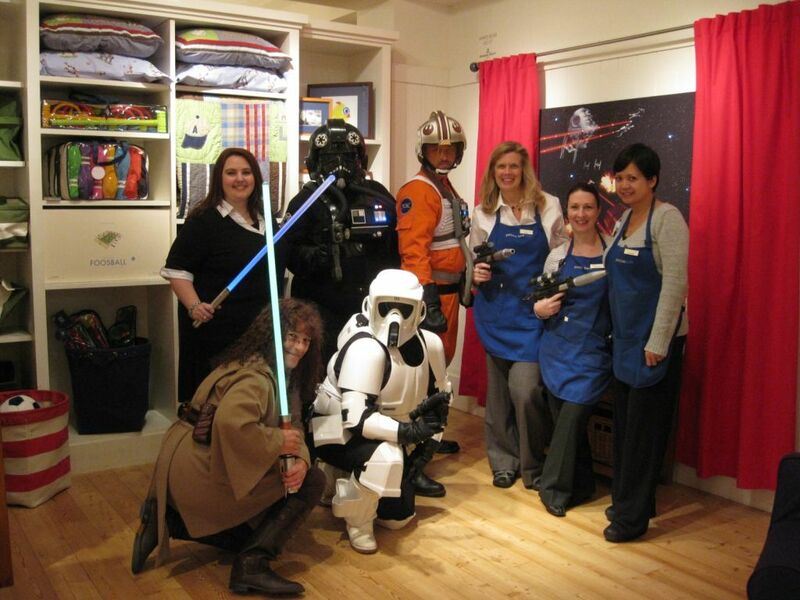 Special thanks to Remo for also doing a "double header" as he also did the Pottery Barn event right before this one. Thanks also to Jessi Tampa for all of the tasks of support. lastly to "Zombie Bunny" (Rob Hamilton's better half) for taking mostly all of the photos that I have to offer....manning the cameras of others can be a pain...so I thank you very much. 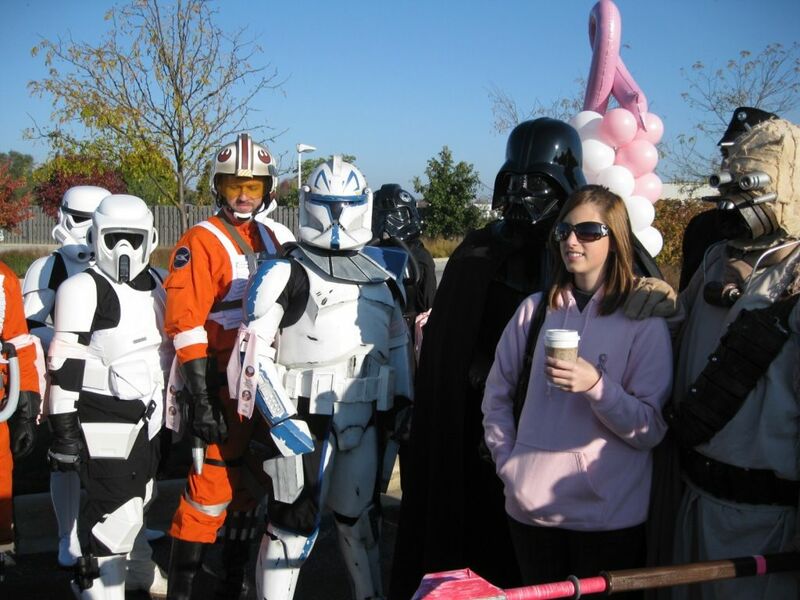 I actually wore my Stormtrooper Armor to this. in the end...we took in $120.00 for the MSABC team. We operated out of the parking lot at Berkots grocery store. 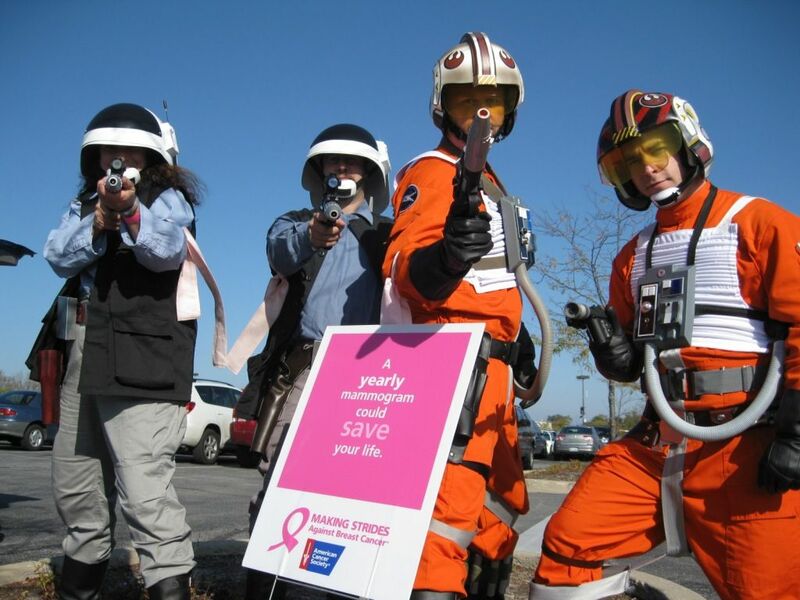 We got a LOT of beeping and waving and some cars of kids stopped by for photos and to donate. We did have one man who saw an item in the local paper about our MSABC walk and came by to purchase an armband that I make for the team...and for those wishing to remember loved ones. and all for a good cause. Making Strides Against Breast Cancer is a non competitive 5K to raise funds and awarness during October which is Breast Cancer Awareness Month. For the past month our troops have been busy fundraising via 2 small "Donation Stations" and from their friends, families, and co-workers. 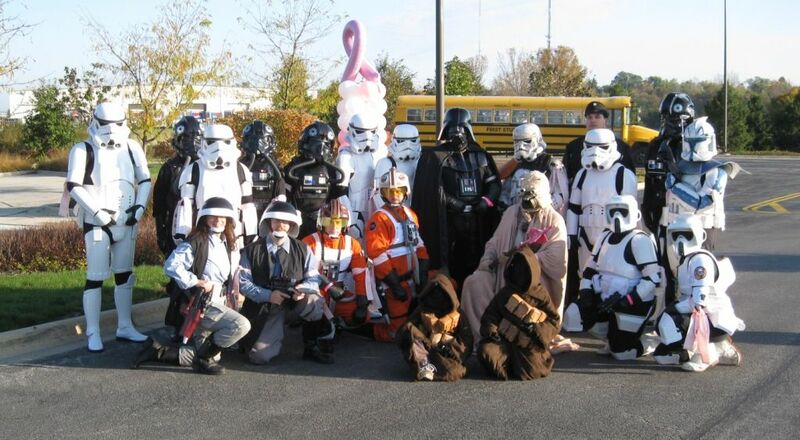 This team of rather unsual Breast Cancer walkers raised an astonishing $4,016.00 (at last count). Part of the money raised was on pink armbands that carried the name of someone who was either "honored" (still alive and battling cancer) or "remembered" (someone lost to cancer). 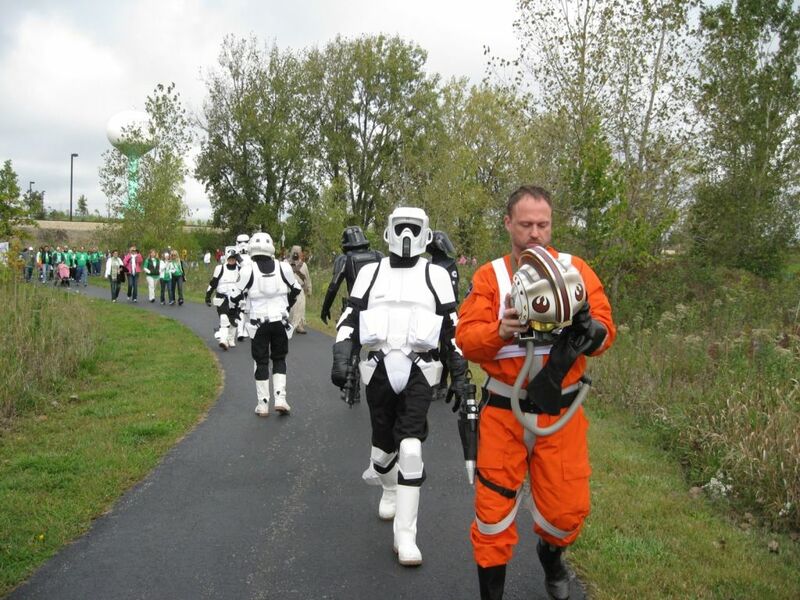 Each of the team members had an armband with their name and logos of the Midwest Garrison and Nar Shaddaa Base on one arm and wore armbands for the armbands of the others who we were honoring and remembering. Thanks to our participants who absolutely went above and beyond. It isn't easy hauling your behind out of bed at 6:00 AM (and earlier) on a Sunday morning when the temperatures outside are at about the freezing mark. I hope I got at least one photo of everyone! 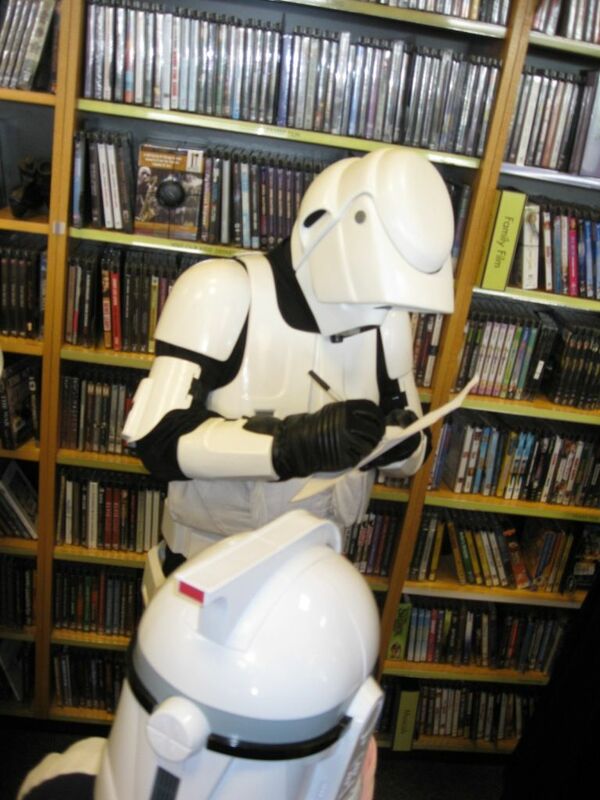 The new hardcover "Death Troopers" was released last week and the author is out on a booksigning tour. His tour brought him to Oak Brook IL on Monday night. 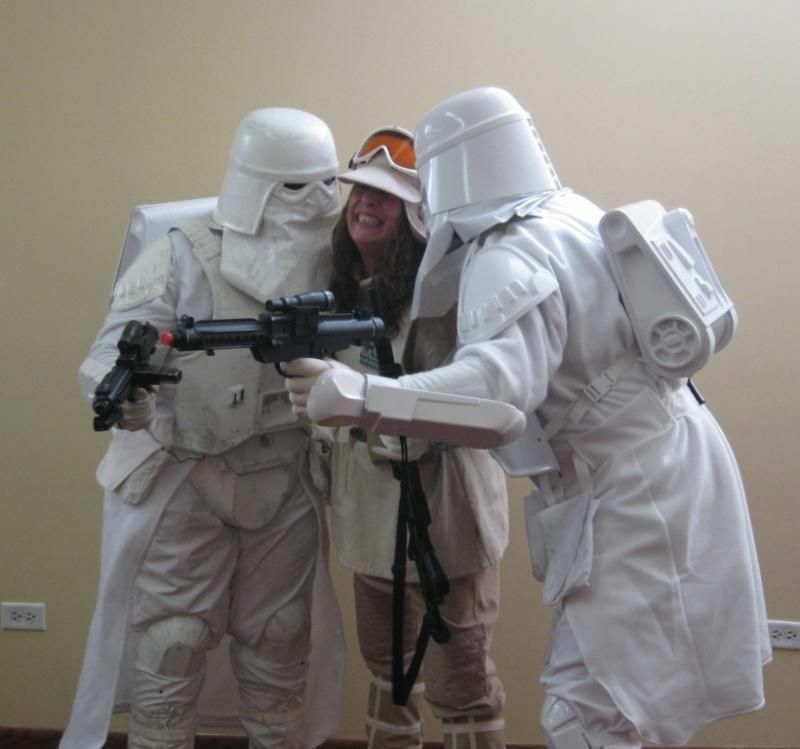 Since the book featured a Stormtrooper bucket on the cover...I decided to wear my TK to this event. 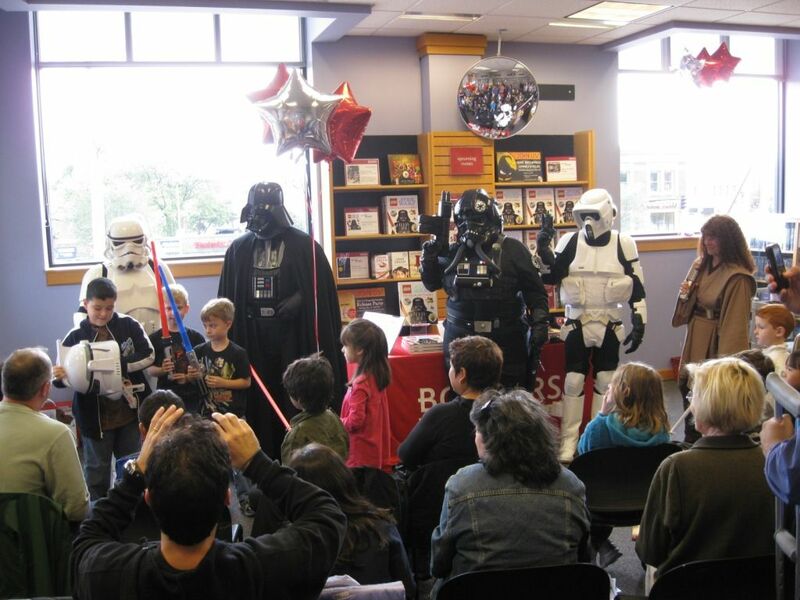 This was one of the MANY events taking place nationwide to hope promte the release of the Lego Star Wars Visual Dictionary. 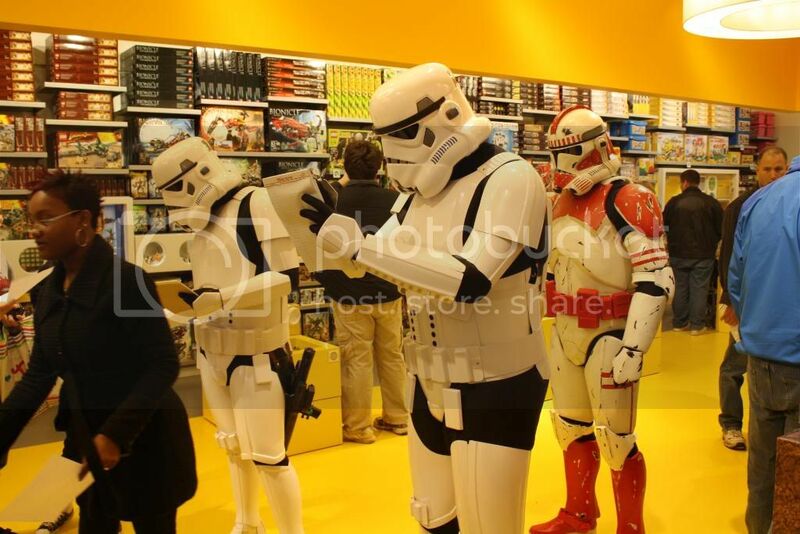 The employees of the Lego store were very excited to see us, and incredibly accomodating for our troops at this location. We were all suited up and set to go right at 2, and there seemed to be a miscommunication about how long we would be there, since they thought we were only there until 3, but were excited to find out we would be there until 4. 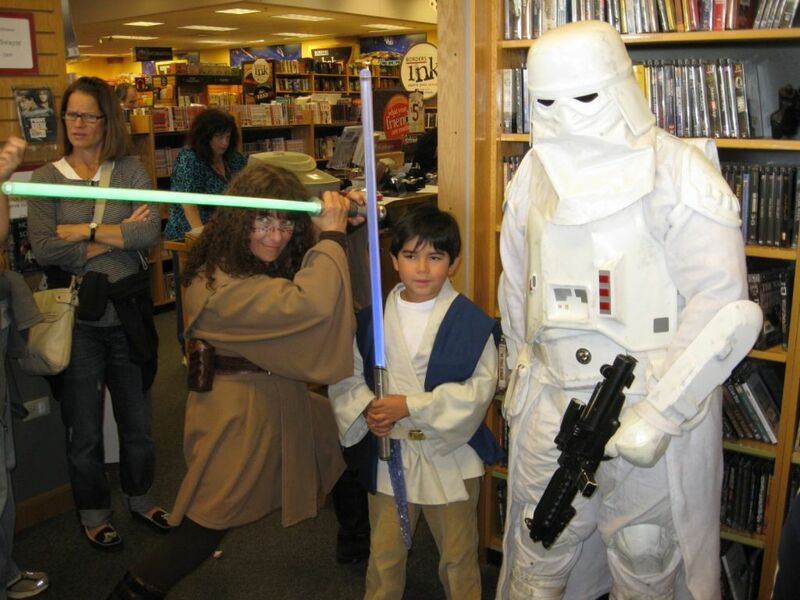 We were greeted by quite a crowd of kids and parents, and for the ensuing 2 hours, spent most of our time signing autographs but occassionally some of us were able to break away and stand near the doors to help draw attention from passerbys and bring them into the store. The kids were generally well behaved and it was a really fun troop! "always outnumbered never out gunned"
had lots of fun...I must of signed 1000 autographs! Kathy Van B for coming out yesterday. also glad you and Jen found some things you could use as Sax Leather. I usually feel 100% more creative just walking through the door. The photos above are just a small portion of that which Lionel has stashed everywhere in his building and in several other garages. Lionel sees possiblities in all things and never likes to throw anything away. Thanks to Neil and Jen for bringing some goodies...and glad you liked the Sloppy Joes...made from sauce home grown and home canned from my vegetable garden. The Italian Bagpipe looks interesting; I am sorry to have missed that. Luke:"I won't fail you—I'm not afraid." Yoda:"Oh, you will be. You will be." 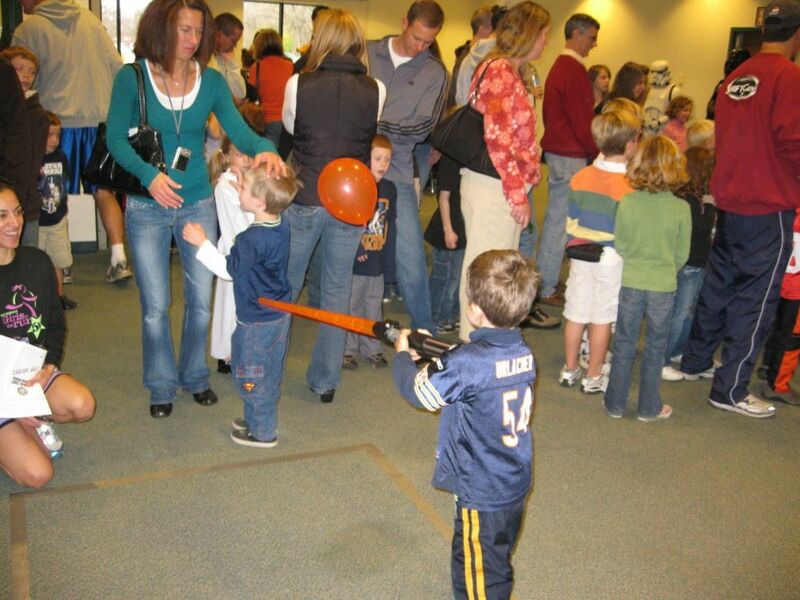 Yesterday's event at the Glen Ellyn Public Library.. 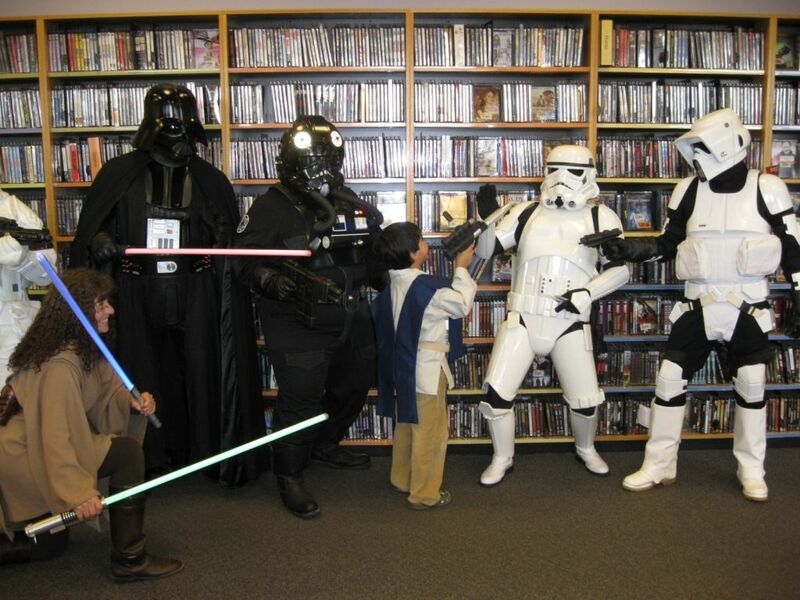 I brought my entire "bag of tricks" out for this one as members of the Midwest Garrison and Nar Shaddaa Base were called upon to throw a "Star Wars Extravaganza" at the Glen Ellyn Public Library. Andrew and I were stationed at the Lightsaber game and I never got out of my corner for nearly 2 hours.. I am not sure who had more fun as choas reigned supreme before the "kids" were let into the area at 2:00...our "kids" were busy shooting each other with the nerf blasters. 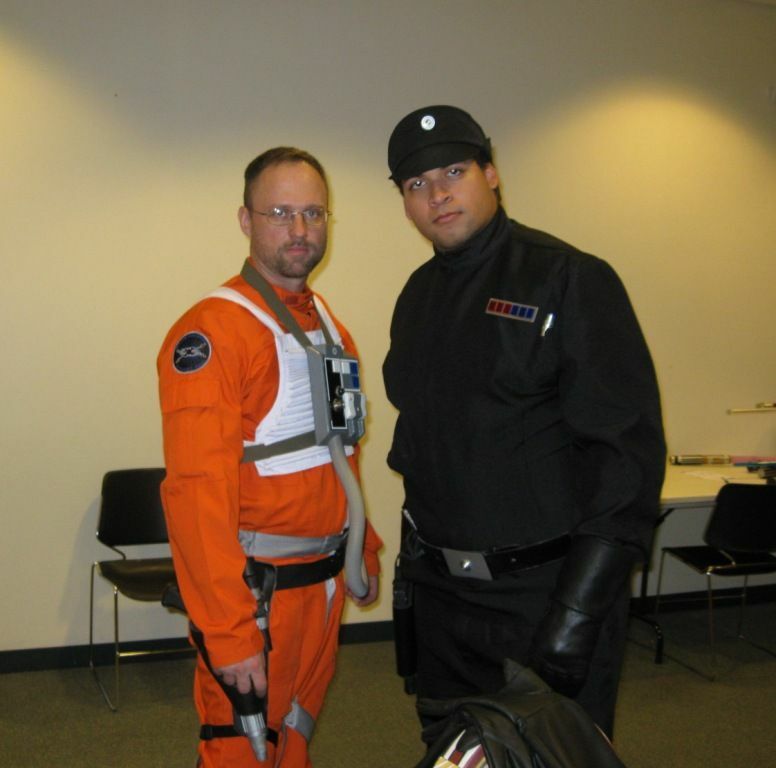 before we headed down to the United Center for "Star Wars In Concert", Augie Webster (XO Nar Shaddaa Base) and I also attended the Toy Con Charity Toy Show in Bridgeview IL. 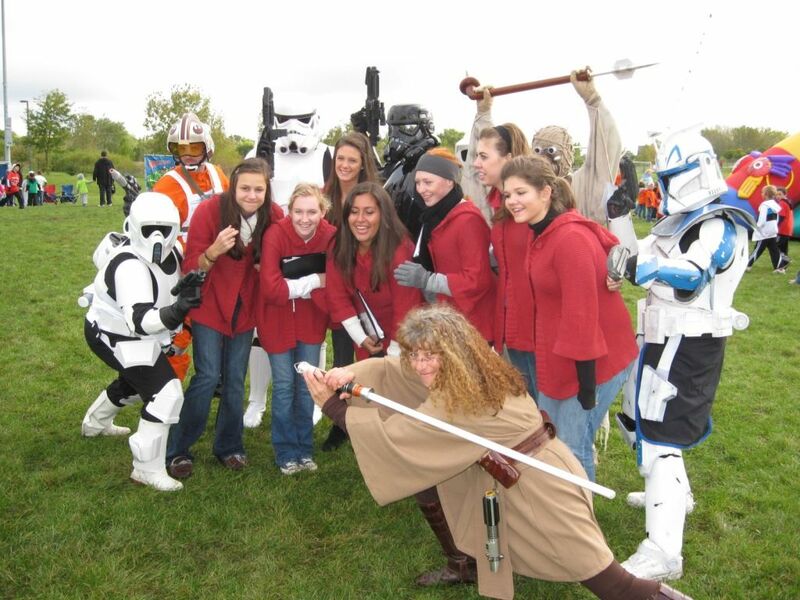 Members of the Midwest Garrison and Nar Shaddaa Base have been participating in this event each year since 2004. We all bring toys along with us that are donated to Children's Treasure Chest for Pediatric Oncology. 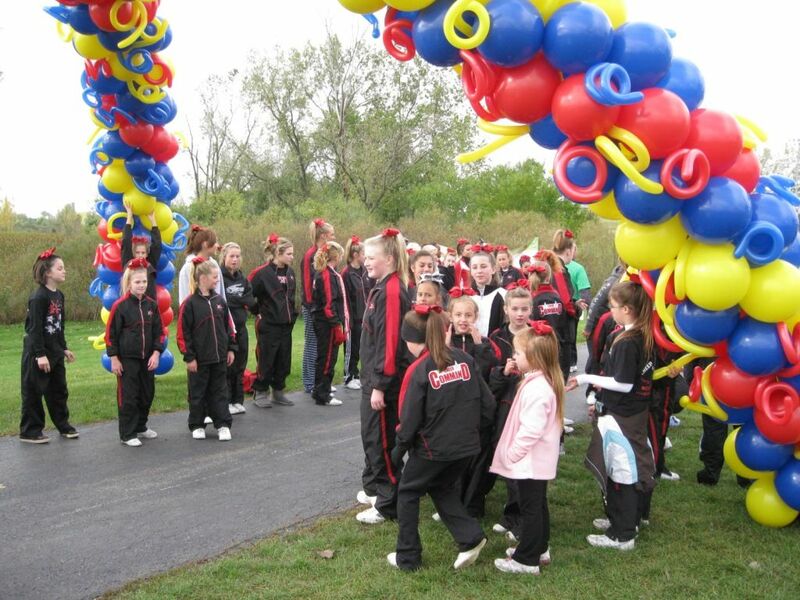 Children's Treasure Chest provides toys to kids undergoing treatments for serious illnesses. 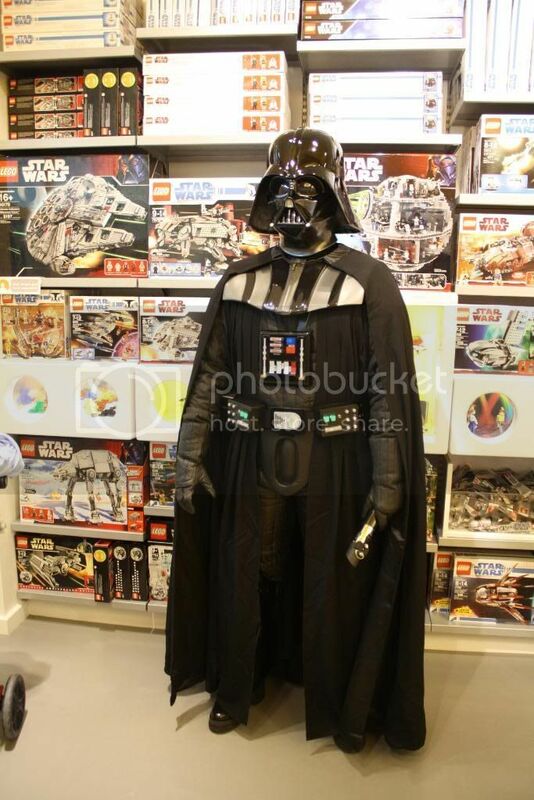 It is hoped that the toys will help them through the difficult treatment process. Photos are taken with our participants for a donation of $10.00. The money raised is used to buy gift cards for the older kids undergoing treatments. 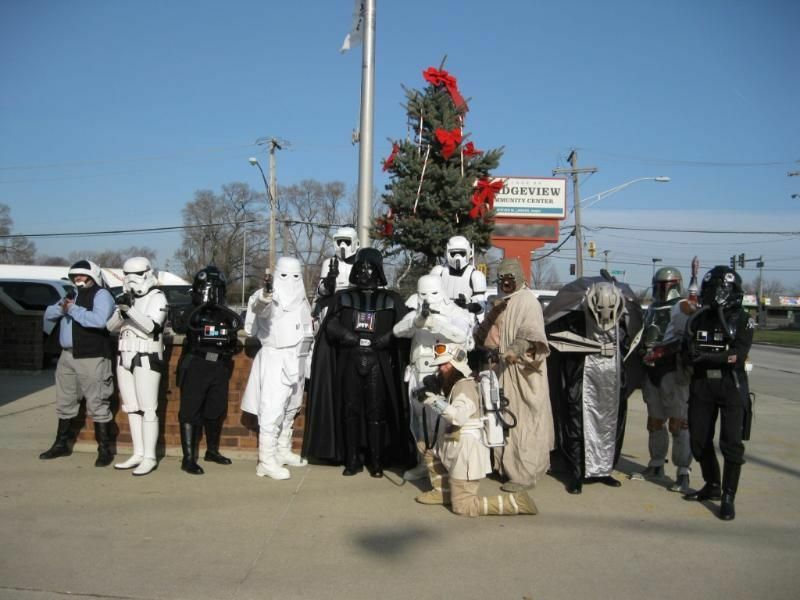 I am uncertain as to how much we raised.....but the important thing is...we came...with toys...and we did raise money. 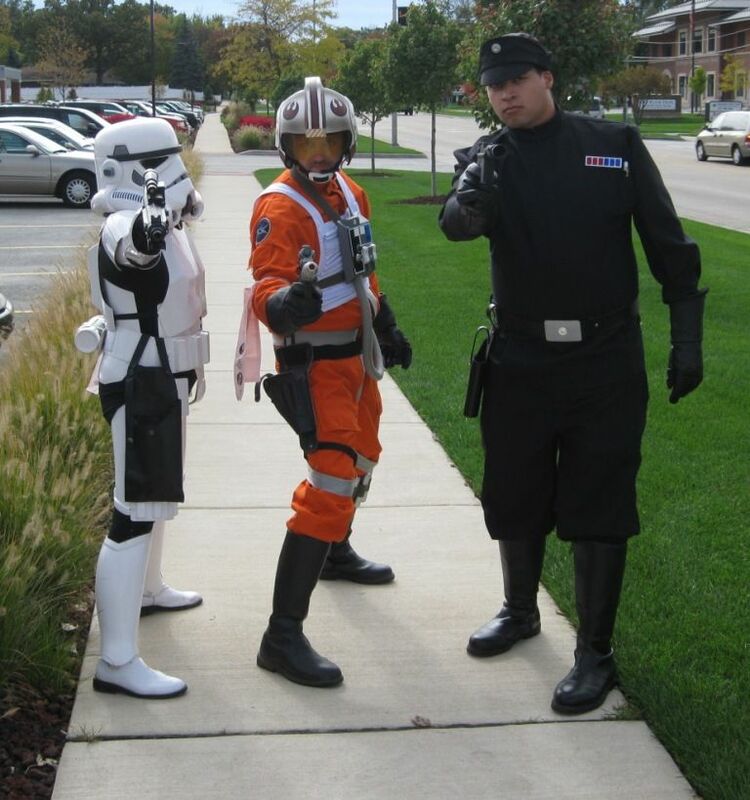 On October 22nd, the Nar Shaddaa Base, Midwest Garrison, and the R2 builders group converged upon Discovery World Museum in Milwaukee, Wisconsin. Discovery World is a hands on museum specializing in connecting innovation, science, technology and the environment with exploration and learning through interactive exhibits and experiential learning programs. 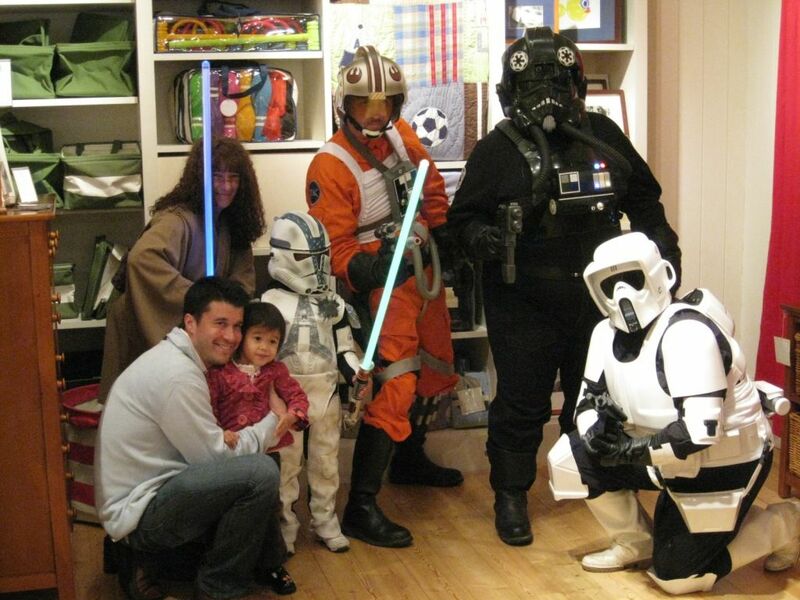 Members from all three organizations took over two of the huge labs with displays of our costumes and props from not only the star wars movies, but also Ghostbusters, Indiana Jones, Harry Potter and Monty Python and the Holy Grail to name a few. 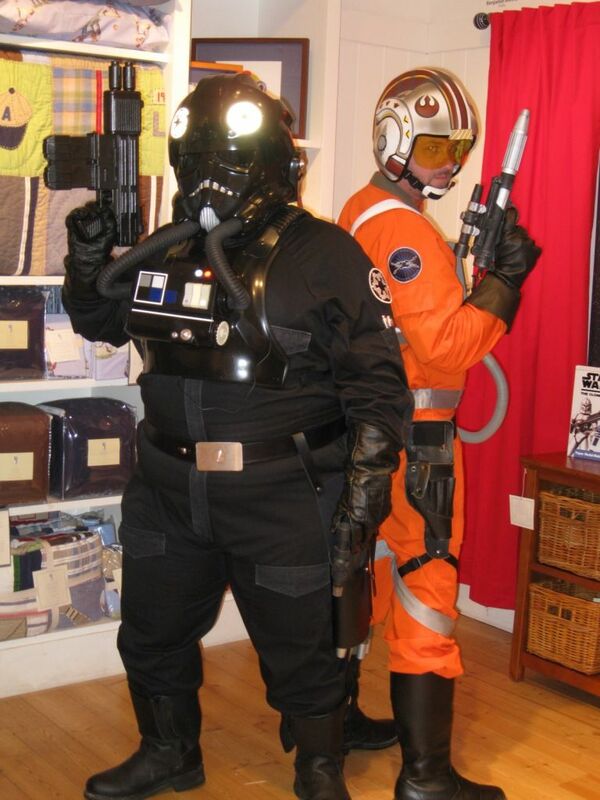 Two additional labs were designated as prop building rooms where a biker scout build took place for new member Tom Hobson and various props were constructed. 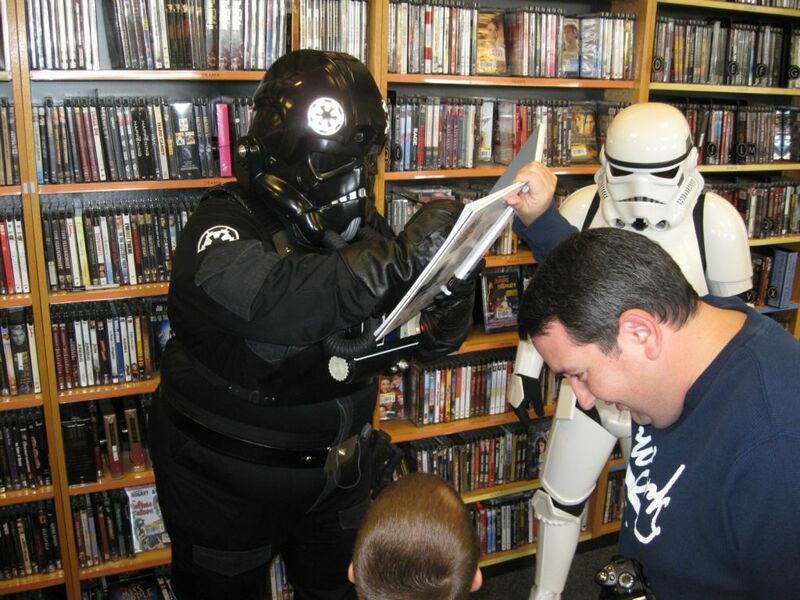 Rebel Legion member Bob Kohn (SoloYT1300) and 501st member Arturo Delgado (BH 412) held a step by step demonstration of a live cast technique, used in mask making, on the promenade. 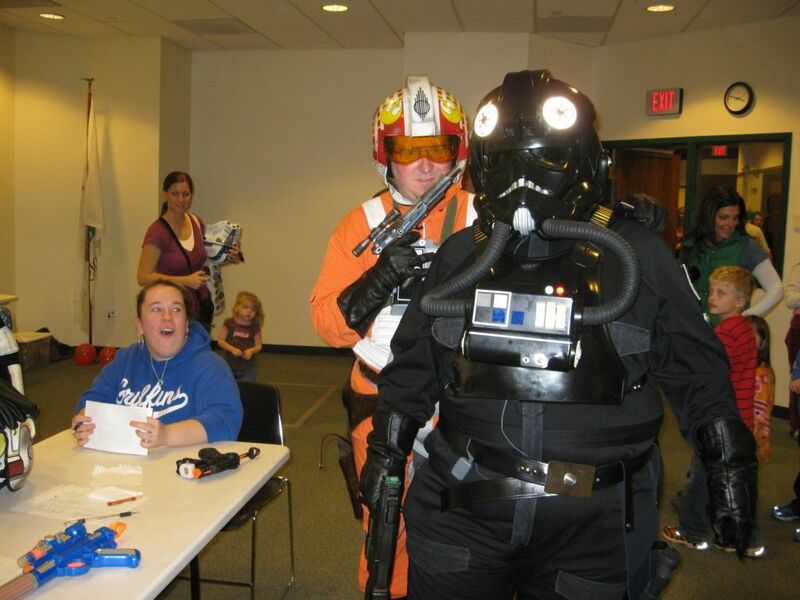 Members also participated in a costume panel detailing construction of Rebel, Imperial, and Ghostbusters costumes. 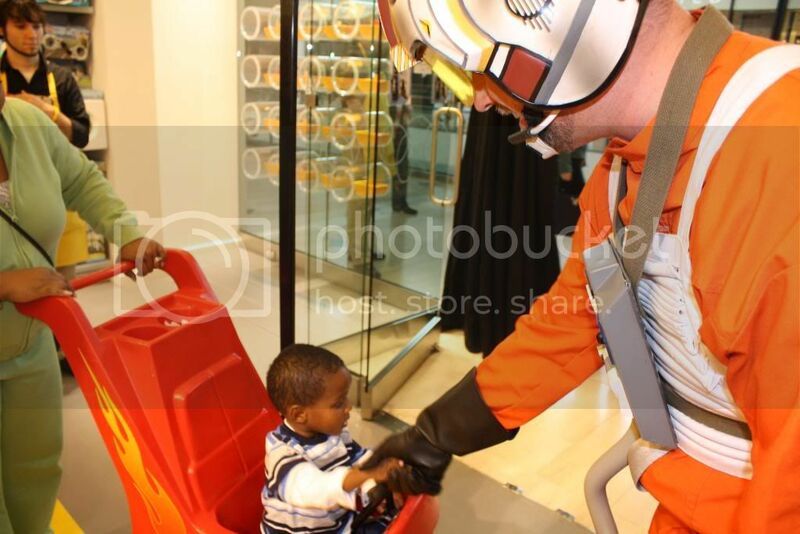 Many members also spent time walking through the museum in costume and posing for pictures with fans young and old alike. 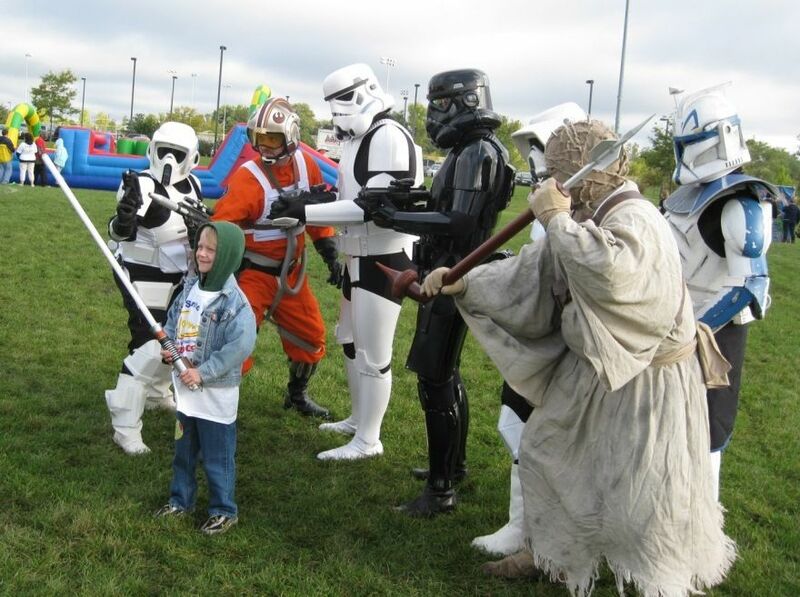 Many of the children that came to see us were also dresses as their favorite Star Wars character which added to the fun. WOW!! 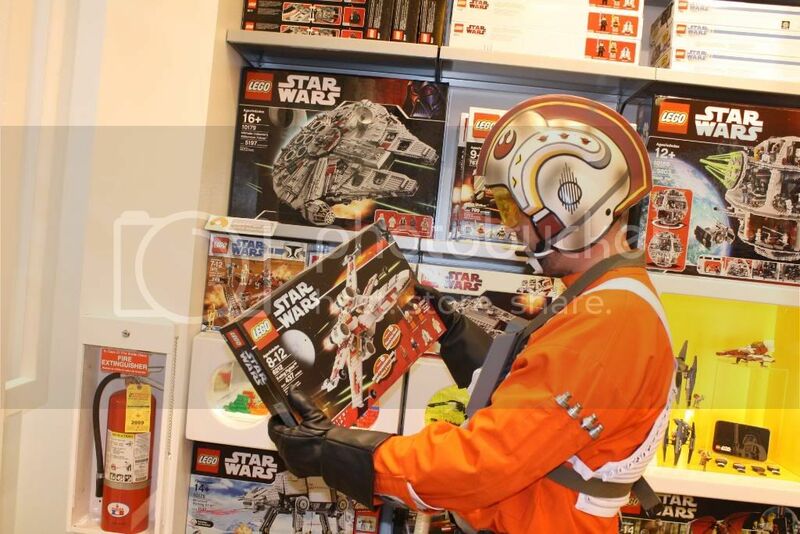 That looks like a Lucasfilm display! Collectively we could probably have our own museum..